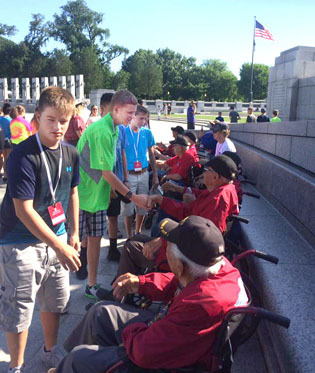 Artesia students honor veterans in D.C. 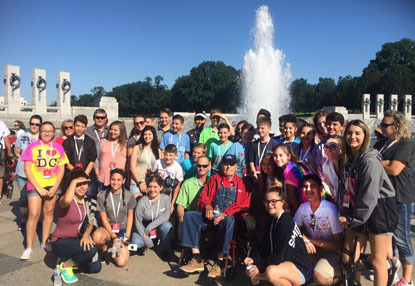 Above, students in Park Junior High School eighth-grade history students pose with local veteran Claude Mauldin, center, today in Washington, D.C. 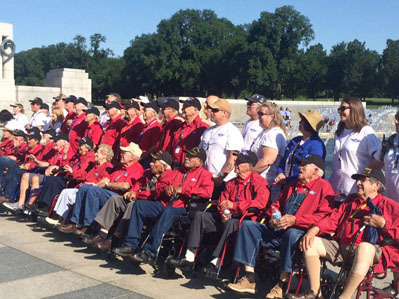 The students, who are on an educational trip to the nation’s capital with teacher Terra Greer, had the chance to meet New Mexico veterans of World War II and the Korean War this morning as they participated in Honor Flight memorials. Mauldin is a veteran of World War II. “We are so blessed to have had the opportunity to have met this group, shake their hands, and tell them, ‘Thank you for your service,’” said Greer. “Both the veterans and students were excited, and we feel honored to share this experience.” Below, veterans are honored during the memorial ceremonies. At right, Park students greet and thank the veterans in attendance.